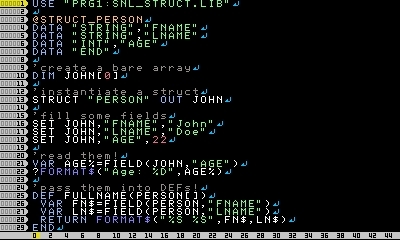 Description This library allows the programmer to define, instantiate, and manipulate structs within SmileBASIC. This library is created with vanilla SB code, no funny tricks. Simple, efficient, and applicable to a broad range of scenarios, it brings SB one step closer to object-oriented paradigms. Instructions Contained in the package are multiple files. The actual library is the PRG SNL_STRUCT.LIB, the rest are test and example files included for demonstration purposes. A complete documentation is coming, but for now examine the examples to get a feel for how it works.